I love beautiful textiles of all kinds. 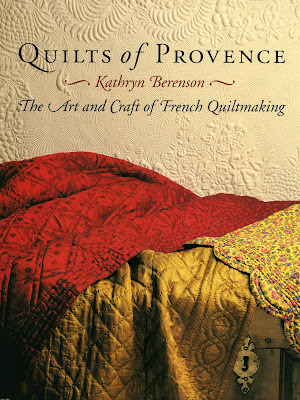 And even though I know very little about the art of quilting, I was captivated by this gem of a book "Quilts of Provence, The Art and Craft of French Quiltmaking" by Kathryn Berenson. A dear friend,who is a passionate quilter, lent it to me. She thought I would enjoy it because of the many photos of French 18th century quilted textiles. She was right! I now want to buy the book for myself and have even contemplated learning how to quilt! (If only I could take lessons from Tristan of Enchanted Revelry....sigh). What I fell in love with were the all-white broderie de Marseille quilts of the late eighteenth and early nineteenth centuries. This form of quilting creates subtle plays of light and shadow on the surface of the textile with intricate patterns of stitching, incorporating cording and delicate stuffing into the stylized forms. According to the author "Knowlegeable French call these elegant works 'confections' and refer to the process of stitching them as 'embroidery from within'. 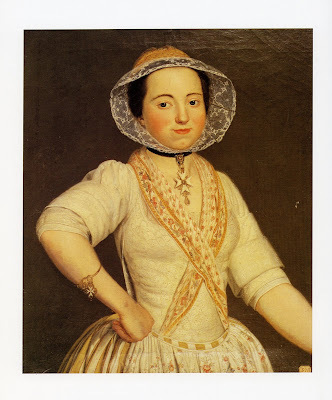 Quilted garments were prized for their beauty and warmth in 18th century France, and Provencal woman's social status was quickly determined by the quality of the stitching on her embroidered petticoat or jupon. Quilted short jackets and stays were also popular as were quilted garments for babies. Also included are appendices on How to Care for and Display Quilts and Where to See and Buy French Quilts. This book is a treasure for quilters, lovers of fashion history, and those passionate about anything French. Not only is it well-written in clear and precise prose, but there are lots of colour photographs to linger over, especially if you want/need to be transported to Provence.